That theme of commonality runs throughout Filmistaan. The movie beautifully makes its point that manufactured borders can’t erase the cultural similarities that unite the people of India and Pakistan, and that it’s the average citizens of both countries who pay the price for ongoing hostility. Sunny is the consummate regular guy. He’s an out-of-shape, out-of-work wannabe actor who admits he doesn’t have the chops to make it in Bollywood. But he persists, taking the job of Assistant Director as a way into the industry. On assignment with an American film crew, Sunny is kidnapped near the Pakistan border in Rajasthan. The militants leave him with a pair of guards in a small village across the border, hoping to nab the more valuable Americans on a second try. Sunny endears himself to the village children with his impressions of Bollywood stars. His love for film sparks a friendship with Aftaab (Inaamulhaq), a movie buff and DVD pirate. And Sunny’s sheer ordinariness leads the younger of his two captors, Jawaad (Gopal Dutt), to question why they’re holding him in the first place. Jawaad’s willingness to question orders — in stark contrast to his devout compatriot, Mehmood (Kumud Mishra) — gets at one of the movie’s other themes: the crippling effect of a lack of opportunities in Pakistan. The only reason Jawaad joined the militants and the only reason Aftaab is a film pirate and not a filmmaker is because of a lack of opportunity, caused primarily by the closed border with India and the zealots like Mehmood who want to keep it closed. Filmistaan is hopeful about the prospects that young people from both countries will someday cast aside national hostilities in exchange for a future built on shared goals and cultural history. The subtlety with which it conveys this message through its story and characters heightens its impact. Since Filmistaan is also a celebration of the movies, it excels in all the necessary ways. The acting is top-notch. Sets are stark and evocative, thanks to writer-director Nitin Kakkar and cinematographer Subhransu. The soundtrack is terrific. The story builds to a cinematic climax that sadly doesn’t allow for the emotional payoff one would hope for. Given the effort that went into making the audience care deeply about the characters, the ending needed to be more cathartic. Still, that doesn’t negate the great journey that Filmistaan takes the audience on. This is a unique and enjoyable film worth seeing. This entry was posted in Reviews and tagged 2012, 2014, 3.5 Stars, Bollywood, Filmistaan, Gopal Dutt, Hindi, Inaamulhaq, Indian, Kumud Mishra, Movie Review, Nitin Kakkar, Sharib Hashmi, Subhransu on June 10, 2014 by Kathy. Glad to know you saw the film and liked it. The one line that you have mentioned at the start greatly impressed me as well. It subtly points out at the hatred being created among people of both the countries by vested interests. Thanks for the link, Keyur. You pointed out in your review something that’s worth emphasizing: this is a really well-made movie. 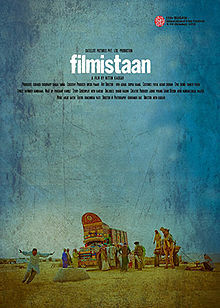 I’m usually willing to forgive things like cinematography and score in indie films, but there’s no need to in Filmistaan. Nitin Kakkar has a bright future as a director. He surely has. Had met him and the two actors. Will mail you my pic with both actors right away. Good observation. Another movie which put the same point across was Veer Zaara! Indeed, Ashok. I like that Filmistaan emphasizes the same themes without a romantic love story. It’s a love story of a different sort, showcasing the love between friends. It’s refreshing. Thanks. Would try to catch up on this one then!